Dr. Helen McIntosh has a doctorate in Counseling Psychology, is a counselor certified in Reality Therapy, is an author and inventor of The Peace Rug®, a tool to help resolve conflicts among students. Her book Messages To Myself: Overcoming a Distorted Self-Image (Beacon Hill Press, 2009). As a school counselor, she wrote the book, Eric, Jose & The Peace Rug® (2006) to help students resolve conflicts with peers. With it, she developed the tools students needed so they would no longer remain “victims.” She spent 18 years in public education and wrote “Tears & Fears” – a resource in the back of the book: Lifting Our Eyes: Finding God’s Grace Through the Virginia Tech Tragedy (Penguin/Berkley, 2007). For 12 years, she was the Elementary School Counselor at Roan School in Georgia. For decades she was a speaker throughout the Southeast for CWC (Christian Women’s Club) now Stonecroft Ministries. And for many decades she has been a Bible teacher at church and the community and has taught at retreats. Helen received her B.A. in Psychology from Hollins College in Virginia. She received her Master of Education in Guidance and Counseling from West Georgia College. She received her Specialist in Education in Guidance and Counseling from the State University of West Georgia. And she has her Doctor of Education in Counseling Psychology from the University of Sarasota. She has written for Guideposts and ParentLife, and has been reviewed in HomeLife magazine, Chattanooga Times-Free Press, the Daily Citizen newspaper and others. She has appeared on TV shows and many radio interviews and has been featured on the cover of Boomer Times and Senior Life which is inserted in the Miami Herald, and has done radio interviews for World Talk Radio on Voice of America. She has been a guest columnist on The Christian Post and other websites and blogs. She has written over 150 posts as guest columnist for www.braveandresililient.com. She also has authored a pamphlet given to neurology patients entitled, “Grief, Depression, Parkinson’s & You.” She has done volunteer counseling in northwest Georgia. She resides in Georgia with her husband Jim of 50 years. They are the parents of Dr. Bryan McIntosh (and his wife Lynn) and Blythe McIntosh Daniel (and her husband Art). They are the grandparents of four granddaughters and one grandson. 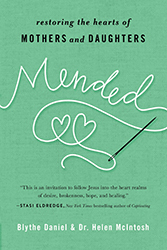 She is the co-author of the book Mending the Hearts of Mothers & Daughters with her daughter Blythe (Harvest House, 2019). Helen says she loves people and she loves problems to solve. She is known as an encourager, a truth-teller and clarifier. She says, “I mostly hope people see Jesus”!